Why are these 10 the best 2016 cars under $20K? No matter your automotive budget, there’s little substitute for the peace of mind that comes with a brand-new car and the new-car warranty that comes with it. Limit your search to $20,000 or less, and that security, along with the latest in safety and connectivity features and fuel-economy-boosting tech, becomes critically important. Our 10 Best Cheap Cars price ceiling is a $20,000 suggested retail price without options but including the manufacturers’ destination fee, which average about $800. Presented here in alphabetical order, you’ll note that none is a large car, but each is a standout for value. Some are design-efficiency gems. One or two are even lookers. All are very good cheap cars. Wrapped in standout styling that sets it apart in a field of lookalike compacts, Dart traces its basic engineering to Italy’s Alfa Romeo, where its Old Country equivalent is the Giulietta. That makes it look and drive a little sportier than the norm, though it still possesses good-old Midwest values: it’s built at the Fiat-Chrysler assembly plant in Belvedere, Ill. In its transformation, the Dart has put on some American pounds, so consider bypassing the two least powerful four-cylinder engines, the turbocharged 1.4-liter and the naturally aspirated 2.0-liter, with their 160 horsepower each. Go for the 184-horsepower 2.4-liter. You can pair it with the six-speed dual-clutch automatic transmission for just under $19,000 in the basic SE model, or stretch your budget to get that combo in the better-equipped SXT, at just over $21,000. If, however, you’re after the line’s best fuel-economy ratings, the answer is the 1.4-liter turbocharged Aero model. It’s rated 28/41/32 mpg city/highway/combined, though it’s priced nearly $4,000 more than the base Dart, which rates a still-laudable 27/37/31 mpg with the same engine. To please your racier side, consider the 2.4-liter GT version with assorted performance-minded upgrades; it’s $22,990 with manual transmission. 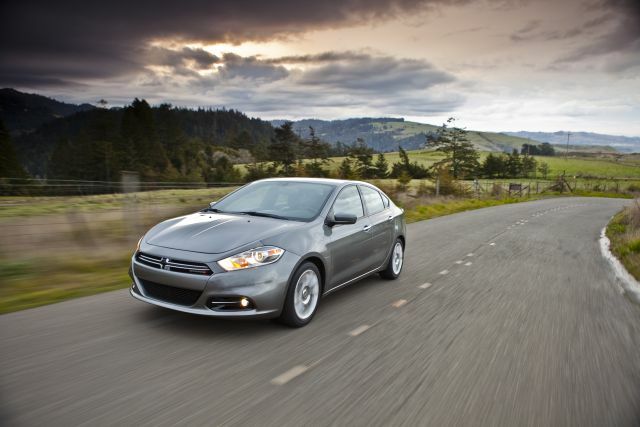 And if you love the way the Dart looks and you have pockets deep enough to cover a near-$25K starting price, check out the top-line Limited model. It comes packed with amenities, including a moonroof, heated leather seats, push-button entry/start, and a navigation system. Options include a blind spot monitor with cross path detection.